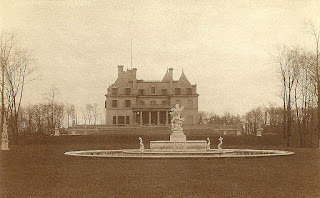 'Harbor Hill', the Clarence H. Mackay estate designed by McKim, Mead & White between 1899-1905 in Roslyn as seen from the West. Click HERE and HERE for more on 'Harbor Hill'. Photo courtesy of Old Grey Dog. OGD - Thanks for the photo! DED - You always seem to put your finger right on it! Harbor Hill is so wonderful in so many ways, but damn, it IS soulless. Is it my imagination or does the house appear boarded up? I think you're mistaking the fake windows of the stair tower as boards. It's not uncommon for staircases, fireplaces and other obstructions. My Grandparents lived in Old Roslyn around 1918 - 1929 where they had the only tailor shop/ first dry cleaner in town. They lived in an apartment above the shop and my mother was born there in 1918. The Staffs, usually the chauffeurs would bring in their master's shirts and suits from all of the neighboring Estates on Long Island. my grandparents were the only Jewish family in town, and they told me the KKK used to ride-in occasionally. My mother had to attend a catholic school taught by nuns when the public school burned down. I was told by my Grandfather that Mr. Mackay sent his chauffeur with a truck to help my family move back to Brooklyn when the market crashed in 1929 and he heard that my grandparents lost their business to the collapsed banks. In late 1949 my mother built a new house in East Hills,and she moved back when I was only one year old. From 1953-1955 I used to climb up the Hill of the Mackay's Estate with my neighbor friend's grandfather and I would play in the ruins of the marble pools. Trees had grown right through some of the marble and it looked like ancient Grecian ruins. It was quite magical for a little boy. Oh, the irony! Katherine's daughter, Ellin, ended up marrying Irving Berlin, and her father disowning her (for some years). Mixed faith marriages were totally prohibited, and I am astonished that this was story is not bigger news for those of us who have also entered into "taboo" marriages of sorts! "She then developed cancer of the eye, which her husband removed and replaced with a glass one. During her recovery her husband left her for her nurse."